Daily Spirit & Word: 818: Shining Your Light For Jesus. Good morning my friends, what an awesome day Sunday was. First worship with all the family together, we made a long chain of paper strips to show how the LORD wants UNITY in His family, and how it takes EFFORT to maintain that unity. Then we had an opportunity to let the LIGHT of Jesus shine out in West Norwood from the steps of the church as thousands gathered for the FEAST. We’d been invited to sing Christmas Carols, it was cold, windy and sunny, but what precious UNITY as five churches sang out together. Those who believe and trust in Jesus Christ as Lord and Saviour are RIGHTEOUS. However, note this, we’re not righteous because of anything good we’ve done or because of how religious or devoted we are, we’re only righteous because of what Jesus has done for us. He died to make us right in God’s sight. It’s by faith in Jesus that our unrighteousness is washed clean. So my friends, having been MADE RIGHTEOUS, let us therefore allow His light to shine out, and the pathway will become ever more brighter for us. It will also enable others to see the clear pathway to the Light of Christ. Amen. 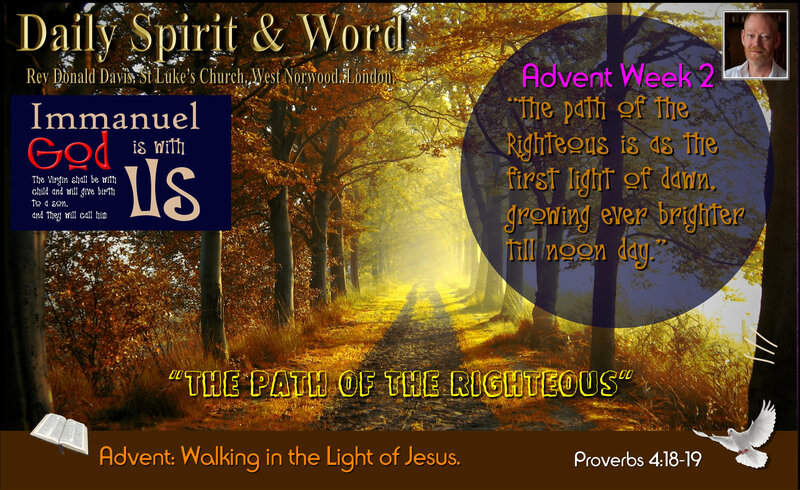 As John tells us, 1 John 1:5-7 (NIV) Walking In The Light. I want to WALK in the LIGHT today. I want to BE a LIGHT for Jesus. I want EVERYONE to ESCAPE the DARKNESS. I want to LEAD others into the LIGHT. Next PostNext The Maker’s Stamp. Made by God.